I have this peculiar habit of altering recipes every time. I love to cook but not the usual recipes every day. To keep the fun part I like to experiment and when that is not possible I try to give the everyday dishes a twist. Now a days even the husband and the kid are aware of it. so the days when the dish comes out very good the husband brings my recipe book and ask me to write it down. I try to blog as much as I can, stealing time from my very busy schedule yet at least 50 more folders are there with recipes and pictures, waiting for their time in the blog's space. The recipe I am sharing today is a spicy pickle recipe. 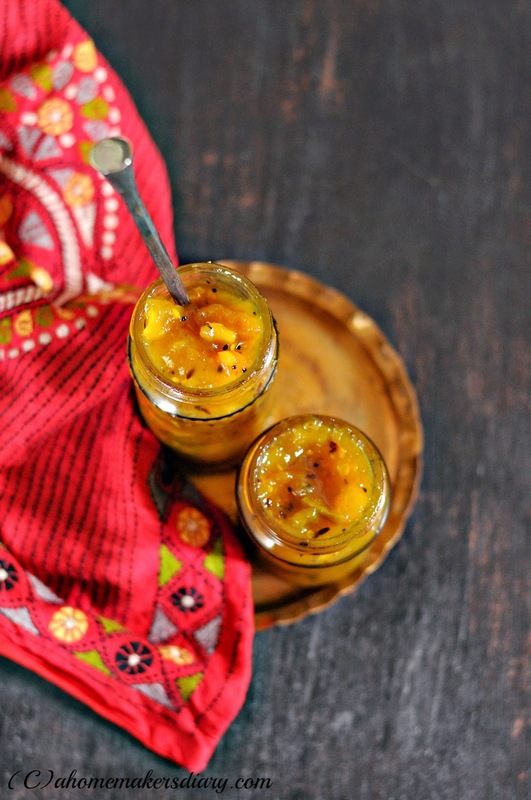 Remember my gur aam or sweet and spicy mango pickle with jaggery. I make it every summer as my whole family is fond of sweet and spicy pickles. Tart- salty pickles are just not our thing. This year there is a severe decline in mango production and the prices following that are really high. We decided not make much of pickle this year, only little bit for the family. So few weeks back Hubby brought couple of kgs of really good quality raw mango. My instant thought was to make Gur aam but I also wanted to use green chilies in the dish, which is my current favourite. 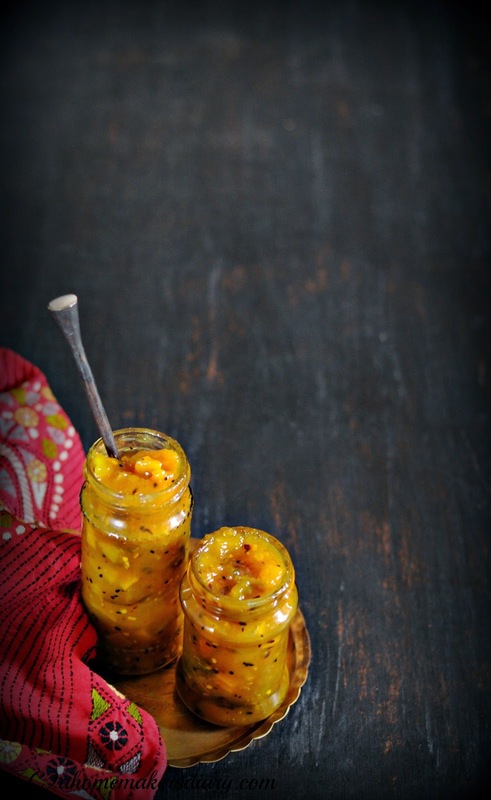 So i altered the recipe quite a bit and came up with this super delectable mango pickle which is almost like a spicy chutney. The mango flavour is very pronounced in this dish along with green chilies. 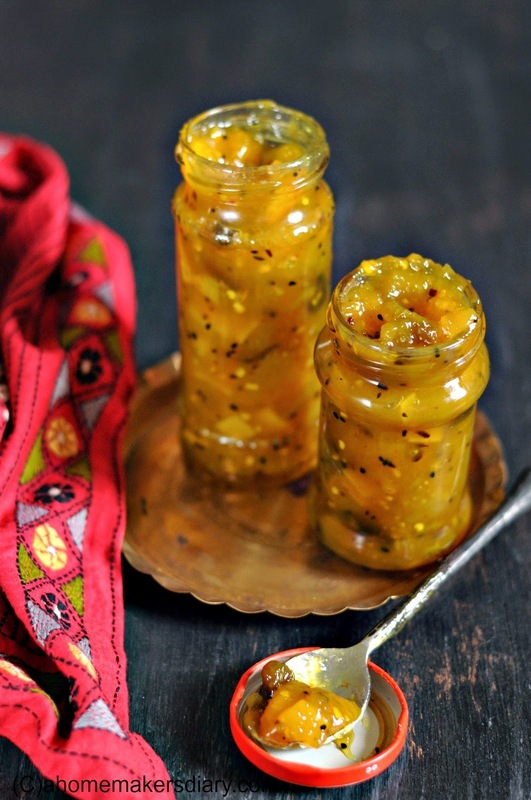 This pickle is our current favourite and we need a spoonful of this with each meal. Cut the green chilies in small sections and soak in the vinegar for 2 hours. In the mean time Peel and chop the mangoes in small 1/2" sized cubes. Soak in water for half n hour. Make sure you discard all the green parts of the mangoes. Heat the oil in a heavy bottom pan or kadhai. Add the Panchforon and let it splutter and turn golden. Drain and pour in the mango pieces. Add salt, turmeric and give it a good stir. Also mix in the chili pieces along with the vinegar, cover. Let the mangoes cook on low flame for 8-10 minutes till its soft but holds shape. This cooking time will depend on the variety of mangoes so keep an eye on it. Now add the sugar and cook till the sugar is melted. give it a good mix. Cover and switch off the flame. Let it stand for 4-5 hours for the mangoes to release juice and the sugar to sip in. At the end of this time cook the pickle again on low flame till all the mango juice is dried up and oil starts to ooze out from the sides (another 10-15 minutes). Cool completely and then pour in sterilised jar. Cover the top with cling film and then tighten the lid. It will stay good for a couple of months on a cool dry place. Otherwise you will have to store in the fridge. 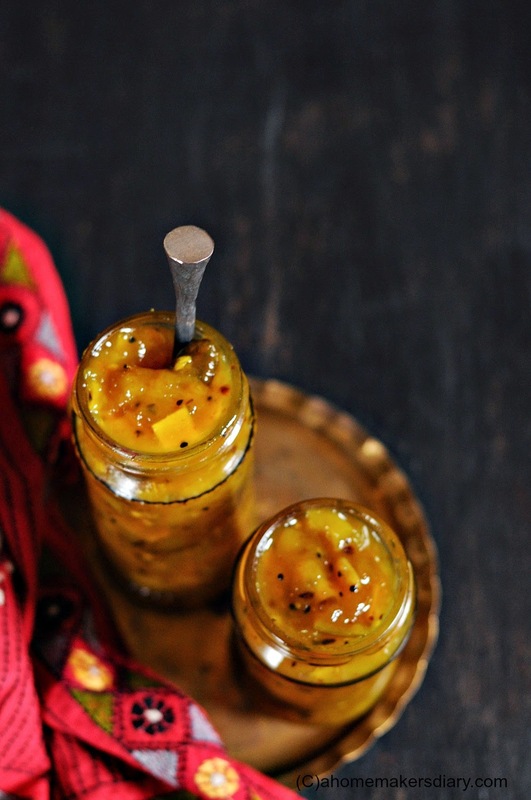 For any pickle Mangoes that are sour works best. Always use firm raw mangoes for this recipe. You can cook the pickle/ chutney till smooth. We like little bites in our chutney so cooked little less. Do not substitute the Mustard oil with any other variety. The flavour and taste of this recipe depends a lot on mustard oil. Another superb recipe. I had tried your almost instant green chili pickle and it was wow. Love your posts !! Tangy and yummy pickle. Wish to have it with curd rice. The pics are gorgeous !! Love the simple presentation... and what can i say about the chutney .. Slurp!! @Anon, Panchforon is Bengali five spice mix please see the link attached to it. This looks really great. Yum! Superb recipe and stunning photographs ! 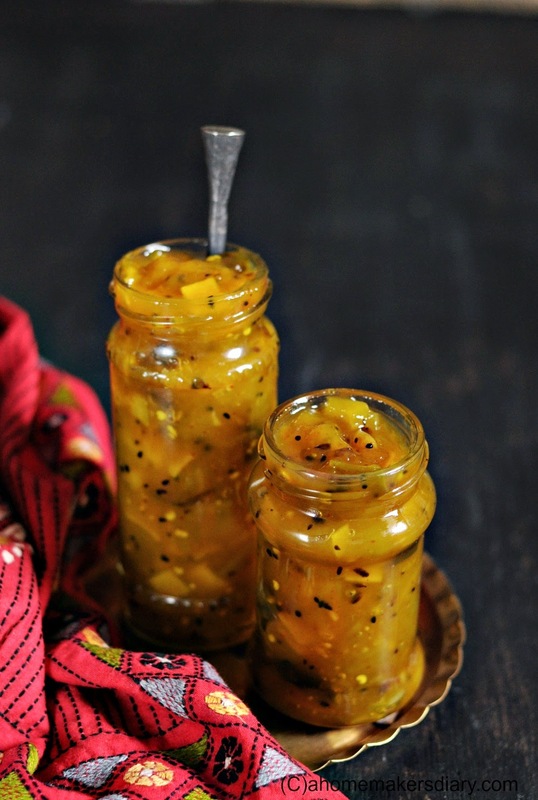 Tasty and tangy looking mango chutney. Wonderfully prepared. Awesome clicks.. Chutney looks superb and delicious..
A new chutney-pickle! Love the interplay of tang and spice!